This past (well, almost past) semester, I took a course called "Spirit, Worship and Mission." It's the best class I've taken in seminary, no question. The professor, Dr. Jeremy Begbie, is an incredible theologian and musician and a great teacher. That would have been enough, but this class made us look hard at how we think and talk about the third person of the Trinity. Turns out that the answer for me at the beginning of the class was "not much" or basically "as decoration." 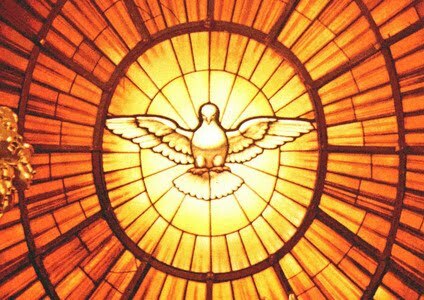 Now, I'm fascinated by the Holy Spirit and was thrilled to learn I'll be preaching on Pentecost, a reaction I would not have had a year ago. The Spirit unifies. This is true in the immanent Trinity (within God's self) and the economic Trinity (how the triune God interacts with the world). Augustine spoke of the Spirit as the bond of love between the Father and Son, a lovely image that I've long held to as my only actual understanding of the Spirit; the danger with this is that it tends to reduce the Spirit to a thing without agency or person, but it does speak to the function of the Spirit as sharing in and joining together intratrinitarian love. The Spirit also unites people with God and with each other. The Spirit opens out. I love this one. As with most of these moves, it's multi-layered. The Spirit opens out the Trinity to us, us to the Trinity, and us to each other. Eugene Rogers, in his book After the Spirit (post on that coming soon), talks about the wounds of Christ and the breaking of bread in the Eucharist as a very visceral way of the Trinity opening itself out to us. The Spirit is both the gift and the giver, pointing us to Christ while giving us herself to enable us to follow and participate in him, opening us out to live into the love we have been given. The Spirit also opens us out to the world for mission and service. The Spirit particularizes. The unifying work of the Spirit is never at the expense of diversity. The Spirit creates, abides in and loves diversity. 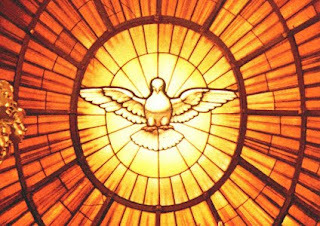 The Spirit can and does work through a vast array of cultures, languages (hello, Pentecost? ), worship styles, etc. The Spirit does not whitewash us, but gathers us into the triune life in all our God-given particularity. The Spirit previews. The Spirit likes to give us teasers. I guess "foretastes" is a better term. In baptism, the Spirit is not only washing us of sin but also preparing us for a heavenly banquet, preparing us to be clothed with Christ as a preview of the completeness in which we will be in the eschaton. One thing I discovered over the course of the semester is that this also means that the Spirit reviews, looking back over God's long salvation history and drawing it all together in Christ. The Spirit plays jazz. That's just another way of saying that the Spirit improvises. Of course, within the triune life, nothing is actually unexpected, but from our perspective, the Spirit regularly moves in surprising ways. These surprises are always consistent with the nature of God and often serve to shake us out of our assumptions about what we know to be true about God. I have a ton of books that we read or that were just recommended in my class, so there will certainly be further blog posts about the Spirit and writing thereon, but that's just a little taste of what I learned this semester and why I've grown to love and hunger to know the Spirit. I've also begun writing some songs about the Holy Spirit, so those will be forthcoming as well. In the meantime, here's a beautiful song by Keith Getty, "Holy Spirit, Living Breath of God."